It is always interesting to pinpoint the moment when one becomes conscious of a change of mood or orientation in contemporary artistic practices. In the midst of so many articulations of the interconnectedness of art and architecture or art and activism; of the material and conceptual repercussions of photography moving from an age of technological to one of digital reproduction; of the links between individual and collective practice, with all the attendant jargon of ‘global connectivity’ and ‘multimedia platforms’ afforded by the seductive ubiquity of the internet, something has emerged that offers quite a different tonic. This ‘something’ might be termed ‘mindful matter’: it is materialism with a twist, or with a new twist. Early in the twentieth century, German art historians were discussing visual art in terms of a sweep that ranged from optic to haptic responses: poles of perception that address sight and touch respectively, but in a rather abstract fashion. But the new materialism is anything but abstract. It is synthetic, inviting the convergence of forms of address that would previously have been considered oppositional. It taps readily into a strand of contemporary philosophical thinking that aims to dissolve the ontological distinction between organic and inorganic, between the vitally human and the inanimate thing. Invoking a Nietzchean conflation of soul, mind or ego with the material body, it has variously, and sometimes contentiously, attracted to itself labels such as ‘posthumanism’ (Donna Haraway) and ‘vibrant matter’ (Jane Bennett). In the wake of advances in the natural sciences and technology, and prompted by changing conceptions of material causality, philosophers and theorists of culture and science alike have begun to explore the limits of human agency, in particular in human interaction with – or exploitation of – nature (transformed from ‘virgin’ to always-already acculturated). The separation of mind from matter, or human rationality from chaotic nature, was hyperbolised in Descartes’ notion of the cogito, figured as radically separate from the corporeal substance of the material world. For Descartes, ‘I think’ stood in opposition not only to ‘I am,’ but also to ‘it is.’ But the ethos of the new materialism is anti-Cartesian in its eradication of this dualism, preferring instead a ‘monological account of emergent, generative material being,’ exploring the characteristic shape of human embodiment in relation to a perceptual field that is always situated in relation to that particular body (my body). From this embodied point of view, the world is always my world. Had they conspired to do so, exhibiting institutions in London could not have come up with a wider array of shows that explore the relation between tactility and visuality, and that so variously probe materiality, not as brute stuff, but as embodiment, where sight, touch, movement, affect and language converge, also bringing in their wake a range of potential affective responses on a compass between revulsion and delight. 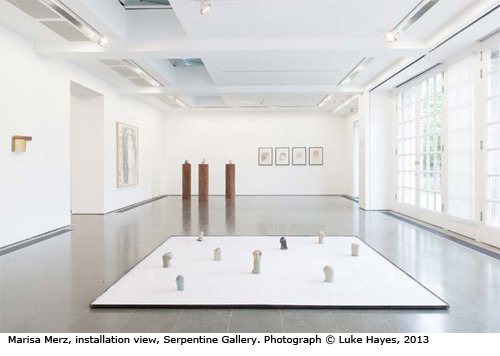 Marisa Merz at the Serpentine Gallery (28 September – 10 November 2013), touted as ‘the only female artist affiliated to the radical 1960s art movement, Arte Povera,’ won the Golden Lion Award for Lifetime Achievement at the 2013 Venice Biennale. She shows work that cuts across distinct media such as painting and sculpture, and that eschews the classical modernist distinction between figuration and abstraction, whimsically and idiosyncratically inviting both visual and tactile involvement and associations. 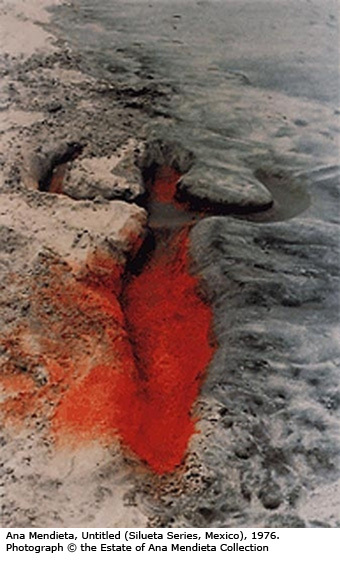 At the Hayward Gallery, a retrospective of Cuban artist Ana Mendieta (Traces, Hayward Gallery, 24 September – 15 December 2013) brings to light not only her famous Siluetas, but also some lesser known works and practices, always ephemeral and poetic, that privilege the body’s action upon, in and with landscape and matter, heavily charged with symbolic and ritual intent. The Whitechapel Gallery (Situation Absolute Beach Man Rubble, 2 October – 15 December 2013) disgorges Sarah Lucas’s obsession with sexual organs and attributes as eroticised, fanciful and sometimes repellent part objects. Using food, fabric, stockings, found objects, photography, and more traditional art materials like bronze and plaster, Lucas hilariously and unsettlingly invokes an idea of human sexuality as polymorphous and hermaphroditic. Exploratory and idiosyncratic, her works not only invite a tactile response, but also display a consummate feel for materials. 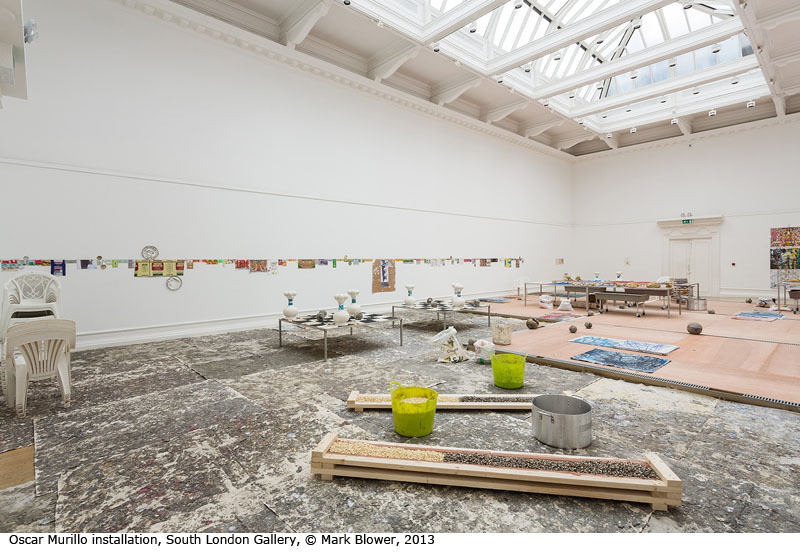 A different kind of address to materials and the senses and a different kind of heterogeneity of practice is explored in the first major solo exhibition in the UK of young Colombian artist, Oscar Murillo’s ( South London Gallery, 20 September – 1 December 2013). Murillo, whose work has already generated great hype, has emptied his studio into the main gallery space. The traditional paraphernalia of the artist’s studio, together with the material vestiges of specific social situations, are processed, reprocessed, translated and transformed. The artefacts of culture are dismantled and mashed to re-emerge as new form, generating new practice. The exhibition seems to be not so much a destination as a station in the ongoing processing of culture in culture. And finally, young Argentine artist Adrian Villar Rojas, whose career has already been meteoric (he has shown at MOMA PS1 in New York, at the latest Venice Biennale and the latest Documenta), has inaugurated the new Serpentine Sackler Gallery with Today We Reboot the Planet (28 September – 10 November 2013), a monumental installation dealing with a post-anthropocene vision of symbiotic plant and animal life on our planet, where all forms of culture (in all senses of that term) are levelled. 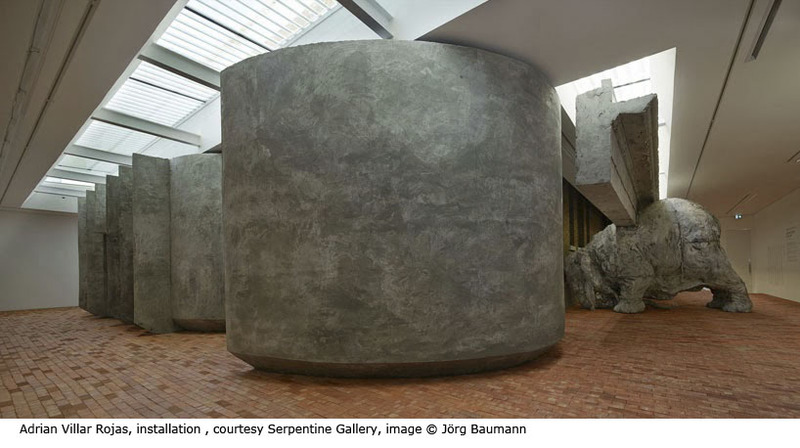 Working with a large team of collaborators to which he refers (in utopian fashion) as a ‘society,’ the artist has created pieces out of mud, clay and brick, drawing together ecological, environmental and political concerns with science fiction, quantum mechanics and popular culture. Somewhere between workshop, laboratory, dugout and nuclear shelter, a clay-walled space contains some 2000 objects, a huge variety of sculpted and organic elements. This panoply suggests a hypothetical scenario, a post-apocalyptic time when our knowledge and the institutions in which we deposit our hopes and beliefs no longer hold sway or, indeed, mean anything. Michelangelo’s David, toy kittens, bones, plastic water bottles, pieces of soap, vegetable matter, and the fossilised body of Kurt Cobain: the whole planet, the artist suggests, might be a readymade, compostable into new configurations in some unknown future. Deferring always to another site of production (a traditional brickworks in Rosario, Argentina), this exhibition represents an enormous and theatrical gesture in the face of the purely conceptual or virtual. The work collides with the aesthetics of primitivism, brutalism and the archive (to all of which it appears to allude) on the one hand, and post-production processes / screen technologies on the other; eschewing both the white cube and the black box. The gigantic, straining, crumbling elephant wedged against a beam, squashed into a heartrending, persecuted, ‘downward dog’ position, offers a frankly tender view of its massive derriere. This beast startlingly conjures contemporary concerns, bundled into – or emerging from – abundant, heaving, embodied presence. As in the work of Adrian Villar Rojas, ‘matter’ in the work of London-based artist Daniel Silver, comes freighted with concepts. 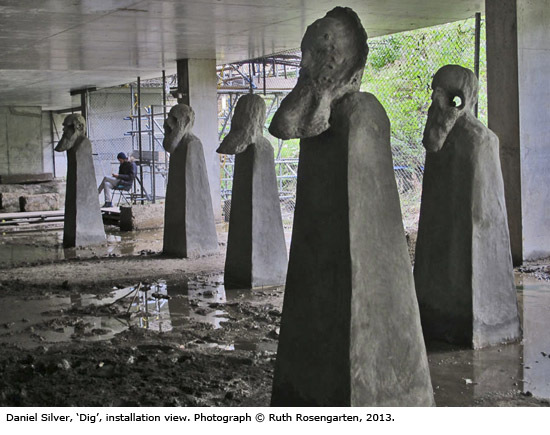 But while the prior invokes the intersecting worlds of ecology, labour and geo-politics, Silver explores the encounter of artistic practice (more specifically, of sculptural practice) with archaeology, literally materialising – giving body to – Freud’s use of archaeological metaphors to describe the workings of the psyche and of memory. On Grafton Way, close to Tottenham Court Road, a plot of undeveloped land now belonging to University College London Hospital was once the site of an Odeon Cinema. Unusually for a piece of prime London real estate, it is abandoned and disused, and I doubt whether many would unintentionally have come upon it as the location of the latest project funded by Artangel, a London-based organisation that has commissioned and produced a range of notable, indeed ‘landmark’ site-specific installations, as well as some projects for film, radio and the internet. Rachel Whiteread, Ilya Kabakov, Steve McQueen, Brian Eno and Laurie Anderson, Michael Landy, Kutlug Ataman, Francis Alÿs, Janet Cardiff, Susan Phillipsz, Roger Hiorns and Clio Barnard are among the many beneficiaries of this far-reaching project. 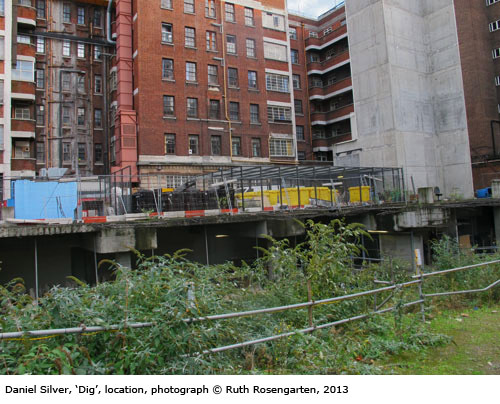 But say you did stumble upon Daniel Silver’s Dig (12 September – 3 November 2013) as if coming upon the site of an archaeological excavation in the midst of this bustling city. You find yourself walking along a rickety boardwalk into the tenebrous, echo-filled, cold, disintegrating remains of a building, with its eroded concrete walls, its stagnating puddles of rain water and its cavernous underground level, its now open spaces all imparting the evocative magic of an urban ruin. Arrayed on trestle tables and on the floor in families – objects grouped together according to their similarities – are pieces that appear to be fragments, worn and broken parts of ancient artefacts. The first pieces you come upon as you enter the room are the most fragmentary and are covered in mud, as if newly unearthed and not yet processed or mended. As you proceed through the space, you are faced with more complete, almost identifiable objects. 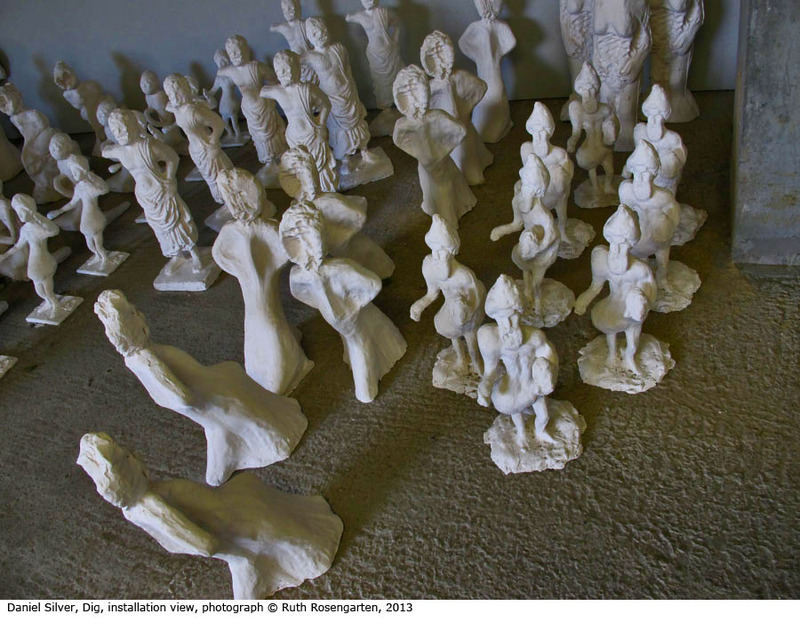 In various shades of white, these bring to the installation all the layered art-historical connotations of that colour, its immersion in the history of bone, marble, porcelain. Daniel Silver has alluded to growing up in Jerusalem, a city under repeated excavation, as well as to the time he spent in that other archetypal site of excavation, Rome, which for Freud (as for many others) was the ‘Eternal City’, paradigmatic in the temporal layers it contained. In Civilization and its Discontents, Freud speaks of the remains of ancient Rome ‘dovetailed into the jumble of a great metropolis,’ existing in the soil ‘beneath its modern buildings’. He notes that this imbrication of different periods exemplifies ‘the manner in which the past is preserved in historical sites’. The city of Rome, then, materially manifests the ways in which ‘what is past in mental life may be preserved and is not necessarily erased’. 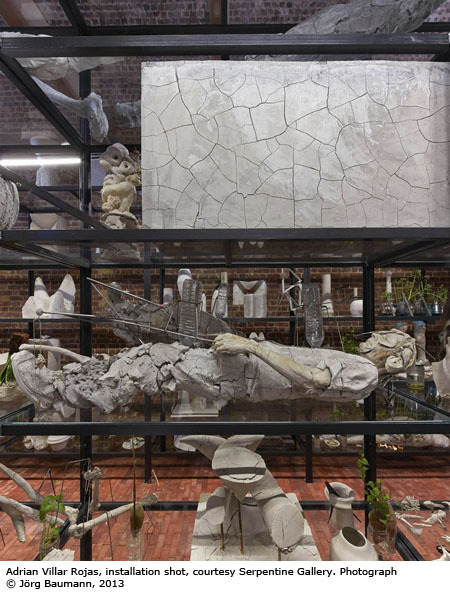 In Silver’s Dig, the allusion to Freud’s Rome, and therefore to digging down into the unconscious, is melded into the intimation of Freud’s London, for the artist invokes the famous collection of archaeological artefacts that Freud kept in his consulting rooms in Hampstead. Often bearded (like Freud himself), made of marble, clay and plaster, the truncated or incomplete standing and lying figures hint at garden gnomes, ancient gods, mythological hybrids, toys representing aliens or mutants bridging the gap between the feminine and the masculine, the animate and the inanimate. This is not so much Adrian Villar Rojas’s post-apocalyptic world, as a projection and materialisation of some inner state. They are strange and unsettling objects of phobia or desire. While we might be tempted to invoke Freud’s idea of the uncanny here, with its specific concern with the ways in which the animate and the inanimate inhabit each other, in fact these works do not seem to provoke that shudder that Freud referred to as the unheimlich, the un-homely feeling of the strangely familiar. This may be because the confusion between animate and inanimate seems to have already happened long ago, rather than being given to view (as if) for the first time. The multiple/serial effect of the images is a distancing device, and Silver’s insistent reiteration of materials traditionally linked with sculptural practice and his exploration of the connotations of these materials, invoke something already entirely mediated. These figures also bridge another gap – between the status of an object as original and handmade on the one hand, and as the outcome of a process of mass production on the other. Finger marks left in clay or pressed into drying plaster erode the figures’ descriptive and referential capability (sometimes a whole face is erased by repeated jabs), and suggest the origin of these figures in manual processes. Nevertheless, the similarity and repetitiveness of the figures themselves, within each ‘family’ group, and the visible marks of ridges remaining after the removal of the plaster mould (where in traditional sculptural practice, this trace of the making process would be sanded down) send contradictory messages. For they allude, on the one hand, to the serial production of cheap toys, and on the other – as in Oscar Murillo’s installation – to the processes whereby an artist transforms matter into art work in the studio. Steps on scaffolding lead one down to a lower level, a kind of basement, and here, solemn, larger-than-life, bearded heads occupying tall plinths stand in brackish pools of water. The atmosphere is desolate and funereal. 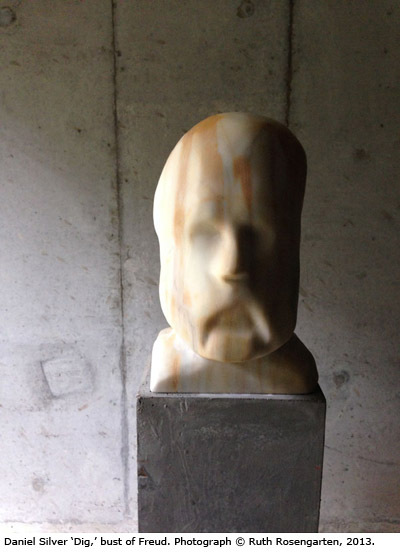 At the bottom end, possibly illuminated by the autumnal sun, standing upon a plinth is a bust of Freud, apparently in marble, but with its features imprecise, as if made of wax or ice cream and beginning to melt, but also reminiscent of the foot of the sculpture St Peter in Rome, worn and smoothed by having been so frequently touched. In this way too, by being so eerily smoothed over, the head elicits a haptic response. Nearby, upon a divan (more Le Corbusier than Freud) lies Freud himself in state, under a pile of morphing heads that allude to the figures in the room above, but that also mine a rich sculptural seam, from Diana of Ephesus to the fragmented and multi-breasted/phallic figures of Louise Bourgeois, or Sarah Lucas for that matter. 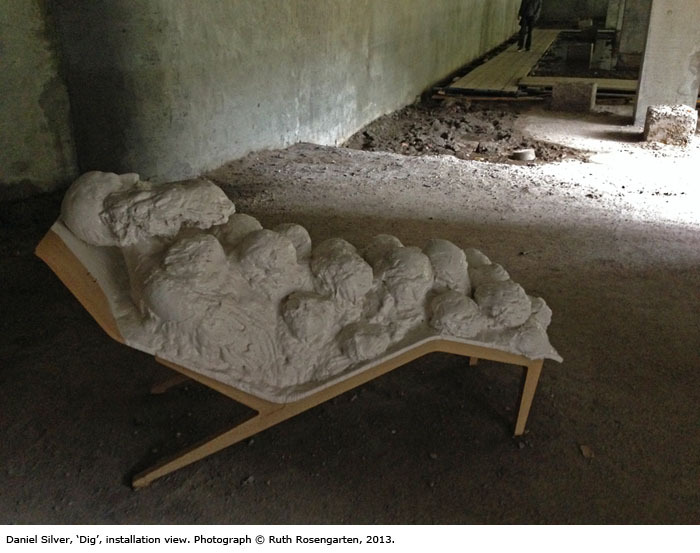 This highly charged, evocative form (or multiplicity of forms) simultaneously suggesting death and polymorphous eroticism, is granted sculptural coherence by the use of plaster as a binding and unifying material, transformed from deliquescent to frangible. Whether smooth or rough, the product of subtractive processes like chiselling or of additive processes like modelling clay and then using plaster moulds, Daniel Silver’s figures bear the traces of facture, the signs of how they were made. Such signs contradict the apparent ‘foundness’ of the objects, constantly reminding us that the whole premise of the work’s staging is faked, a fiction. These are the opposite of objets trouvés. Like other practices I have mentioned here – in particular that of Oscar Murillo and Adrian Villar Rojas – these works declare the procedures that brought them into being, and in their restless, vital physicality, they refuse to coalesce or cohere into singular forms with monolithic meanings. If they are imposing, they are also indeterminate and incomplete, apparently always in the midst of becoming. 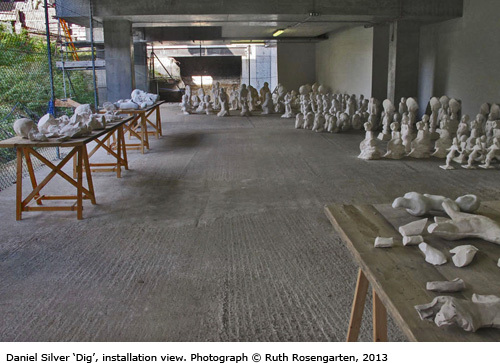 In triangulating archaeological excavation, psychoanalytic transaction and the labour of the artist (himself), Daniel Silver suggests that the nature of the ‘dig’ is as much psychic as material; that the psychic and the material are not so much interdependent as aspects of the same thing. Diana Coole and Samantha Frost (eds. ), ‘Introducing the New Materialisms,’ in New Materialisms: Ontology, Agency, and Politics, Duke University Press, Durham and London, 2010, (location 112 in the ebook).